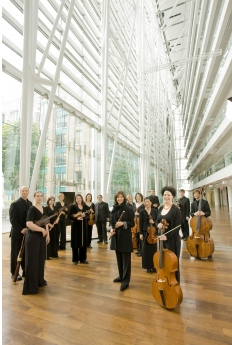 Founded in 1981 in Montreal, Arion Baroque Orchestra is now a cornerstone in the world of early music on period instruments in Quebec and Canada. The clarity and freshness of Arion’s interpretations have been remarked upon since its first concerts; the delicacy of its readings of well-chosen and varied works has never wavered in 37 years. Constant attention to detail has earned the orchestra, led by the enlightened artistic vision of flutist Claire Guimond, a place among the most renowned early music ensembles in North America and throughout the world. The Orchestra offers a prestigious Montreal concert Series featuring more than twenty musicians and with the participation of internationally known guest conductors. Arion has hosted such celebrated conductors as Stefano Montanari, Jaap ter Linden, Monica Huggett, Christophe Rousset, Barthold Kuijken, Rachel Podger and Elizabeth Wallfisch, just to name a few. Many reputed artists have also collaborated with Arion, including soprano Karina Gauvin, harpsichordist Alexander Weimann, and many other soloists considered to be among the best Baroque musicians. Arion has been awarded many prizes and grants and tours regularly in the United States, Mexico, Europe and Japan, as well as Quebec and Canada. Arion now holds an impressive discography of 32 titles. In 2001, Claire Guimond founded early-music.com, dedicated to furthering excellence on period instruments in early music. Largely centered on Arion recordings, early-music.com contributes undeniably to the prestige of these artists thanks to its international diffusion. For Arion's discography, please browse through the early-music.com website. - JUNO Award in the category "Album of the year - Vocal/Choral" for the album "Prima Donna"
- Nomination for the album "Telemann: Tutti Flauti!" at the JUNO Awards in the category "Album of the Year - Classic Music, Large Ensembles"